Weather permitting, Main Street will be closed at Haven Street (both directions) beginning from 10:00 PM on Friday, Sept. 30 until 10:00 PM on Saturday, October 1. Access to businesses will still be possible. Please see the detour plan below. Please be advised that the Town of Reading, through its contractor RAE Contracting, will be replacing one of the brick crosswalks on Main Street at the corner of Haven Street. 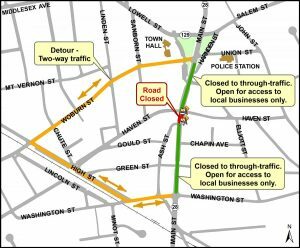 Unfortunately, in order to expedite the project as much as possible, part of this work is required to take place during the overnight hours and will result in the closure of Main St. at Haven St. for about a twenty-four (24) hour period. Access to businesses and residents will still be possible. 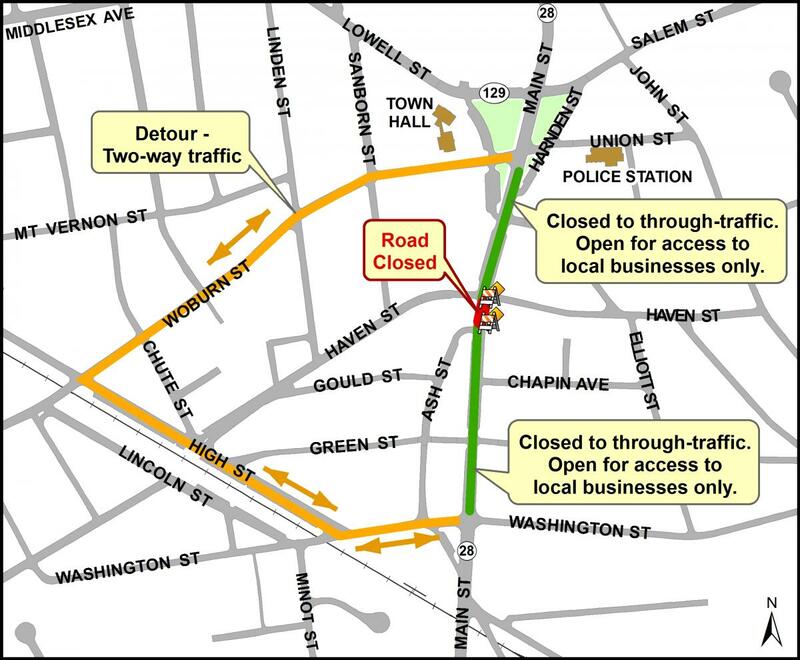 Access to the businesses and residences north of Haven St. will be possible via Woburn St. Access to the businesses and residences south of Haven St. will be possible via Washington St. Please see the detour plan below. On Monday, October 3 from 4:00 AM to approximately 10:00 AM, Main St. at Haven St. will be reduced to one lane. Traffic will be alternated one lane at a time, in order to allow the contractor to complete the remaining work on the crosswalk. We anticipate that this will impact commuter traffic. If you have any questions or concerns, please contact the Town of Reading Engineering Division at 781-942-9082. Additional information, including detour information, can also be found on the Public Works Engineering Division’s webpage at www.readingma.gov. We appreciate your cooperation and patience during this time.